The Ara Pacis Initiative is an international not for profit organization based in Rome, dedicated to the human dimension of peace. We combine international expertise and local wisdom to design culturally sensitive, tailor made, flexible, unique and cutting edge initiatives that encourage and promote healing and reconciliation in the aftermath of conflict. Our practice is rooted in the human dimension, focusing on the restoration of dignity, co-creating new narratives that promote justice, and developing dignity honoring legislative and security frameworks to ensure lasting peace and the empowerment of all marginalized groups, especially women. We work with a horizontal, participatory creative approach, in partnership with grass roots organizations, communities, human rights activists, and members of the creative arts community. We also partner with governments, institutions and leaders from the world of politics, religion, business, sports, culture and the arts, to promote new narratives and new paradigms for lasting and sustainable peace. 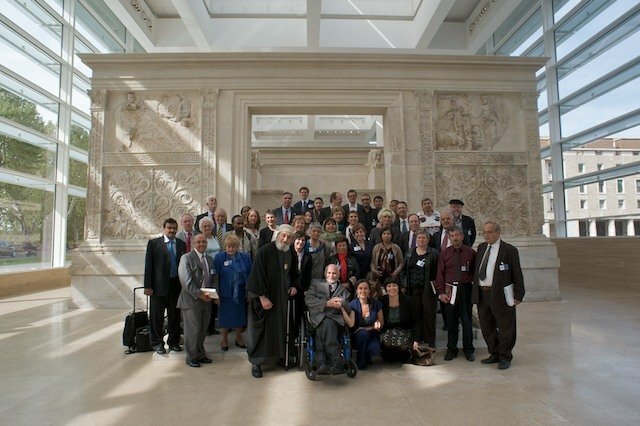 Members of the Ara Pacis Initiative’s Council for Dignity, Forgiveness, Justice and Reconciliation, a body comprised of over 100 human dimension experts and operators – are primarily men and women who have suffered personal and collective tragedy yet have made understanding and forgiveness the starting point of a new existence. Ara Pacis develops programs aimed at overcoming divisions, initiating healing and fostering reconciliation and peace building in societies torn apart by sectarian violence and conflict. Our programs are centered on transforming the human precursors to, and legacies of conflict – ranging from trauma to hate, from prejudice to revenge, from fear to anger and beyond – into dialogue, forbearance, understanding, empathy and mutual collaboration for a shared future. We understand based on our own experience that until these human factors are addressed, personal and collective memories of suffering will return, and enmities will ultimately re-emerge to destroy any progress made towards peace and development, re-engaging populations in cycles of violence and revenge.